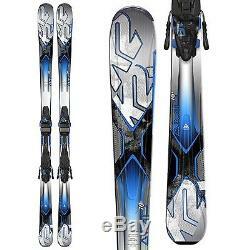 NEW 2015 K2 AMP 76TI SKIS WITH MARKERM3 10.0 BINDINGS. The K2 AMP 76Ti Skis + M3 10 Bindings. Whether you're new to the slopes or are just a little bit rusty, the AMP 76Ti Skis are the ones to get your all-mountain shred on with. You'll be able to conquer any snow conditions with the All-Terrain Rocker that balances an elevated tip for variable and soft snow performance as well as a solid camber to give you power and control in firmer conditions. For added support, K2 used Mod Technology which absorbs vibrations and impact off the ski, so you'll have stronger edge-hold when things get crunchy. All Terrain Rocker Designed for all ability levels with versatility and ease in all snow conditions. All Mountain Baseline 2.0 Optimal resort performance in different conditions and terrain. Forebody Short, round tip for predictable turn initiation. Traditional rise in the tip, but when combined with All-Terrain Rocker it becomes even more versatile in any condition. Mid-Body Moderate sidecut and waist widths ranging from 72-90mm underfoot for bigger sweet spots and trusted stability throughout any turn shape. Medium to high camber for a lively and energetic rebound. Tail Blunt, round tails for a predictable release out of every turn. The tails are generally flat, those with All-Terrain Rocker have camber extended into the tail for rebound while the Catch-Free rocker allows for a more assisted tail release at the end of every turn. Mod Technology High-Performance Suspension System Mod functions by absorbing vibrations and impact loads along the entire ski, providing stronger edge-hold and a higher degree of power and control. Mod is a secondary core that flexes and moves on top of the primary core, allowing the overall ski flex to be unaffected. Metal Laminate Built from the base up, a metal laminate construction consists of alternating layers of fiberglass and titanal above and below the core. Metal Laminates provide damp, accurate, unshakable performance, ideal for expert and advanced level skiers. Hybritech Sidewalls Unique blend of sidewall and cap construction that yields accuracy, power and performance underfoot while remaining lightweight with smooth turn initiation. Bindings Do Not Come Mounted to Skis Always have a certified binding technician mount and adjust your bindings. K2/Marker M3 The ultimate ski/plate/binding system designed for recreational skiers. It utilizes a new Compact Toe and a fixed Compact2 Heel design for control and quickness underfoot, with a 20% lighter design. Turning Radius:ShortCore/Laminates:Composite, Metal Tail. DIN: Release Value 3 TO 10. The item "NEW 2015 K2 AMP 76TI SKIS WITH MARKER M3 10.0 BINDINGS 149 CM" is in sale since Sunday, January 10, 2016. This item is in the category "Sporting Goods\Winter Sports\Downhill Skiing\Skis". The seller is "vss173" and is located in Lincoln, New Hampshire. This item can be shipped worldwide.